The UCI Management Committee, which is meeting in Maastricht, the Netherlands, today approved the calendar for the 2012 UCI Mountain Bike World Cup presented by Shimano. Next year’s edition of the World Cup series will comprise 10 events in nine countries on three continents. There will be seven rounds for each of the traditional mountain bike disciplines: Olympic cross-country, downhill and four-cross. 2012 will also see the introduction of the cross-country eliminator, in which several rounds will go towards a final ranking. This format of racing will also feature for the first time on the program of the 2012 UCI Mountain Bike & Trials World Championships. As in 2011, the 2012 World Cup will open in Pietermaritzburg, South Africa. 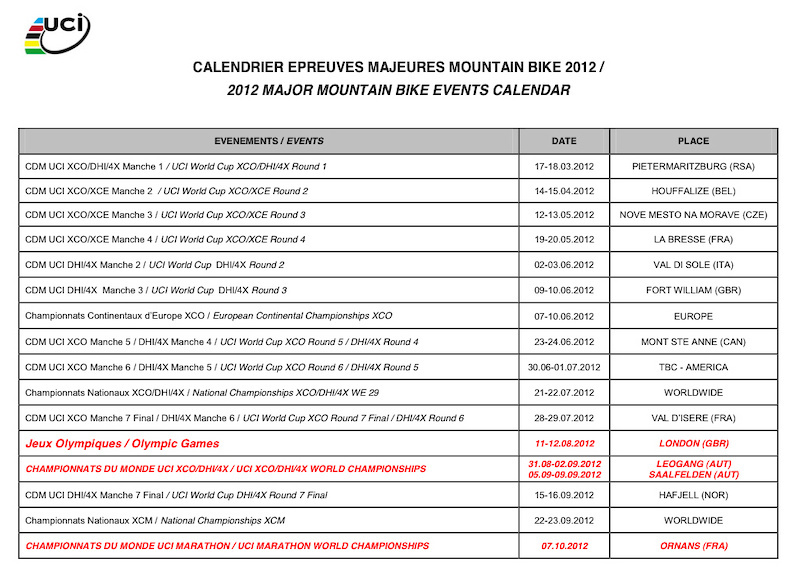 Traditional venues such as Fort William (GBR), Mont-Sainte-Anne (CAN), Val di Sole (ITA) and La Bresse (FRA) once again feature on the 2012 calendar. However La Bresse, known for its downhill course, will this year organise a round of Olympic cross-country in honour of Julien Absalon, multiple World Champion and double Olympic Champion, who lives just 15km from the French World Cup venue. A new triple event will be organised in Val d’Isère (FRA), site of the 2009 World Ski Championships. This will be the final cross-country event of the World Cup season, and the last time these specialists will meet before the 2012 London Olympic Games. Meanwhile, the final downhill and four-cross events will take place in a new venue, the Hafjell Bike Park (NOR), which hosted the 2010 European Championships. Other venues for the 2012 Mountain Bike World Cup are Houffalize (BEL) returning to the calendar after one year’s absence, and Nove Mesto na Morave (CZE) which hosts an event for the second time. One round on the American Continent remains to be confirmed. The 2012 UCI Mountain Bike & Trials World Championships in Austria will be held over two weeks: the downhill and four-cross competitions will take place in Leogang from August 31st to September 2nd, while the Olympic cross-country, cross-country eliminator and trials specialists will confront each other in Saalfelden from September 6th to 9th. The UCI Management Committee today also approved the first four events of the new UCI Mountain Bike Marathon series for 2011 – 2012. This series, which will be qualifying for the 2012 UCI Mountain Bike Marathon World Championships, will begin after the 2011 UCI Mountain Bike Marathon Worlds, which will be held in Montello (ITA) on June 26th. Hey UCI....... there's a place called New Zealand down in the south Pacific come have a look we have some amazing DH trails and a huge MTB following give us a shot we won't disappoint! Thats for sure. Whistler is the King and NZ is the Queen of MTB. @Dexta and we have alot of top 10 proven world cup riders. you guys do the math! Didn't Rotorua hold the World Champs a while back to? yeah, NZ looks like one of the biggest countries for downhill riders to come from, and the tracks all look pretty sick, compared to the RSA track that everyone complained about. so if the uci can't come to ireland for some rain and roots, i'd love to see an nz race! I have also thought about this. Great idea! But yes, a world cup race was held in Rotorua in 2006. And as Gee has said on camera a few times, Queenstown has tracks that are of world cup level. in the south island of new zealand. could you tell me where some tracks are? haha cheers which island is better for riding? Rotorua was the location for 2006 UCI MTB & Trials Worlds, 2009 UCI Trials World Cup - final round and 2010 Singlespeed Worlds (www.rotoruasinglespeed.com). It definitely is not Baseball or any other big sport with dozens of games, but I think it would be tough to do more based on costs alone for travel etc. As a privateer you can expect to spend in upwards of $20.000 in a year just going to the races, not including your products needed to make that happen. I like that we're seeing more/stronger regional series that are popping up and breeding good grass root level racers that may find the support for the WC one day. any one now what Hafjell is like? I agree that it would be harder but I also think it would be incredibly good for the sport. It would display our sport to so many more people in my opinion if we had a consistent schedule with a few more rounds, not a month and a half gap between the first two rounds of gravity racing on the world cup level. Look at a word cup series like Skiing, almost double the rounds as us. j-peters look again...2 and a half months between the first two rounds. okay 2 and a half, I think my point still stands. 2011 sea otter saw how many world cup teams? 1 or 2 on the gravity side of things, Don't get me wrong, it's an important event but come on. we should have 12 rounds! Video links from new DH wc stop hafjell. do you know the story behind that massive running man thing cut into the woods in the hill in the background? The cut out running man was a pictogram for the 1994 winter olympics. Hafjell is located 10 minutes outside Lillehammer who hosted the Winter olympics 1994. Hafjell was the Arena for giant slalom and slalom. Hafjell hosted the European champs in DH last year. I've been to fort bill for the last three years and have waited for this schedule to make plans for next year perhaps going overseas this time. After seeing the smaller crowds at leogang on eurosport I'm thinking do I stick with the uk stage or is anywhere going to equal fort bills electric crowds? Agree, nothing compares to the crowds at Fort William. The UK is mad for DH that's for sure. Ste Anne has good crowds and the course is simply awesome. At least if you make the trip overseas, you can catch 2 DH races as they are on back to back weekends. i think the uci need to shake it up a bit and each country who wants to host a wc event should put a bid in to host it with all there proposals of track and all they have to offer a bit like they do for the football wc then if there proposal is excepted they go in to a draw then the final draw should be done as the lotto draw is where each country is a number. it should be an 8 round event and what ever countries hold the world cup 1 year are exluded from the draw the following year until 5 venues have been pulled out then the years before venues are added to the draw so that you only have a possible 3 venues from the year before and 5 new venues/tracks/countries each year now there would be nothing to stop a country entering with a new venue and entering the draw from the start but it would still mean a new track some where. The American stop to the WC in 2012 better be on the East Cost! Windham was AMAZING last year and I'm going again this year for sure. any info on "UCI Masters Mountain Bike World Championships" for 2012? Whens the next time when the world championship will be held in fort william? anybody no? Can they find a place farther away...oh I forgot, Australia hosted in 2009. I bet that RSA doesn't get a regular WC stop in 2013. One stop is enough. We here in NZ have to spend the most out of any countries privateers getting ours young guys over there because its so far away. We have better tracks and services than South Africa and Australia but we haven't seen the UCI since 2006. If they can spend the money going to SA, then they should remove that crappy flat course and come here. You've all seen follow me. We have some of the best tracks in the world as well as consistently at least 2 or 3 riders in the WC top 10. So apart from the issue of money which can be fixed by cancelling the SA round, whats stopping them coming here? Queenstown now has chairlift access, and dozens of hotels, bars, restaurants, bike shops and the likes literally right out side the pits. Its exactly the same setup as whistler. Considering that NZ & OZ have four riders in the current top ten WC DHi rankings and the current senior & junior world champs, I think we have proved that we deserve a regular spot on the WC tour - in either country. There are better places in OZ to hold a WC level event than dusty old Stromlo. Even if they were to swap from year to year between NZ and AUS, I'm sure dedicated Kiwi's and Australians would make the journey between countries to spectate. This should not be overlooked by the UCI! I hope the American round ends up being Windham! Rumor has it that most riders and teams want a return to Bromont Quebec. Less travel and a very challenging track. Your're right it won't happen as long as Whistler continues to host Crankworx. There used to be some pretty brutal courses out in Colorado, hopefully with Gwin leading the way some American resorts and track builders will come up with the goods. Agree, but a lot has to do with economics. WC DH teams that send riders to compete at Crankworx don't want the added expense of travelling "again" to the west coast. It would be cool to see BC and Washington host back to back WC. @flipfantasia - Can you elaborate.. does the UCI charge a venue to hold an event? I wonder what the cost of a World Cup is compared to an event like Crankworx? I'd assume that Whistler would be a great place to hold a WC! 14 hours from Fort William to Leogang?! What?! Took us about 2 and a half hours to get from Oban (where we were staying) to Fort William, and then 10 hours to get from Oban back to Bath. There's no way in hell you could get to leogang in 14 hours... without the fuzz getting involved anyway. I would kill for a WC stop in Vail, CO again. Too bad the one in 2001 was severly downplayed due to 9/11, (understandable) that the resort will never shell out the money, for what it sees as a losing venture, due to bad previous experience.